We all know Rajasthan experiences an extreme type of temperature, on account of which, travellers have to face hot summers and chilly winters. Despite the fact that this beautiful state has a dry and hot climate for most of the time in a year, it is frequented by millions of tourists; such is its popularity and its mesmerising beauty. But have you ever witnessed its grandeur during the monsoon season? Well, if not, you shouldn't refrain from planning a tour of Rajasthan this season. Following are the certain reasons why every traveller must experience the monsoon in Rajasthan. These reasons will certainly compel you to pack your bags now. If the monsoon season is your thing, then this article is definitely for you and you must read on. It is certainly contradictory that the place, which is known for its extreme weather and hot desert, is home to numerous beautiful lakes which remain filled with soothing waters throughout the year. But did you ever think of the beauty of these lakes which start brimming during the monsoon season? Probably not. During the rainy season, the beauty of Rajasthan is at its summit on account of its dazzling lakes and other enchanting waterbodies which get filled up to the brim, thereby, painting a whole new image of Rajasthan. From Lake Pichola to Pushkar Lake, each and every waterbody makes this incredible state a land of rejuvenating waters during the monsoon season. So, who wouldn't love to relish such beauties? Did you ever try to explore the beauty of the Great Indian Desert, the Thar Desert, with utmost passion and dedication? If not, then certainly the blistering heat of Rajasthan is to be blamed. Unless one possesses some extraordinary passion for travelling, who would want to plod through hot sand dunes? But the monsoon in Rajasthan is all set to surprise you, as, during this period, you can comfortably walk past the sandy expanse of the desert and take a leisure walk amidst its cool environment. The monsoon season makes the Great Indian Desert look like a beauty sent from heaven. So, what do you think about a visit to the Thar Desert this season? Lush greenery and Rajasthan rarely go hand in hand - If you think so, then you certainly need to plan a tour of the Aravalli Range in the state which is greatly responsible for its popularity amongst nature lovers and wildlife photographers. 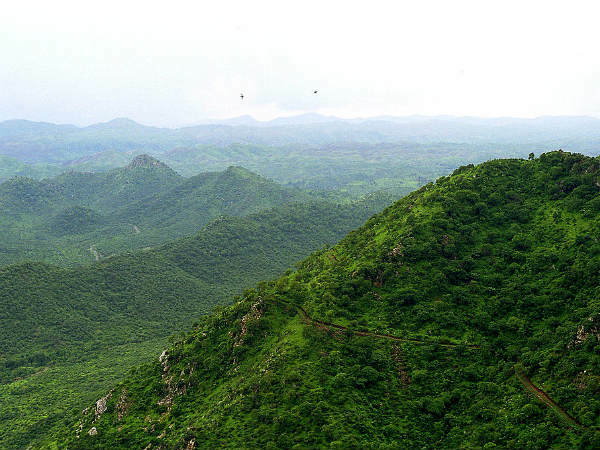 Did you know that the Aravalli Range is the oldest range of fold mountains in the country? So, when Rajasthan is blessed with the heavenly presence of this picturesque range, who wouldn't love to witness its majesty? During the monsoon season, the entire range turns into a green heaven, thereby, looking like a beauty painted in heavenly colours. The range is also rich with several rare and endangered species of plants, animals, butterflies and birds. Well, what else do you need on your vacation? Another reason which makes Rajasthan a must-visit destination during the monsoon season lies in its uncrowded and pristine environment. During the monsoon season, Rajasthan is only visited by the locals and a few offbeat travellers, therefore, the entire state seems like an uncrowded paradise. If you have been looking for such a destination where you can stay undisturbed by the tourist crowd, then this monsoon Rajasthan should be on your bucket list. The national bird of India and one of the most beautiful species in the world, the peacock has been listed in the category of least concern species and hence it is hard to spot them everywhere in India. But Rajasthan is one of the few places in the country where you can easily capture the captivating beauty of peacocks, especially during the monsoon season when they spread their beautiful feathers and dance all around. Have you ever framed peacocks dancing and loitering around? If not, then you shouldn't miss out on visiting this royal state this monsoon. Wouldn't you love to start your day with the wake-up call of a peacock in the morning? The beauty of Rajasthan is certainly incomplete without its majestic forts and royal places. Irrespective of what the topic is about, no one cannot forget to mention the beauty of its forts and palaces. After all, they are the most visited places in the state. During the monsoon season, their beauty gets enhanced on account of their pleasant surroundings, thereby, making them look more photogenic. Who wouldn't love to capture the beauty of the City Palace in Udaipur when the nearby Lake Pichola brims with water and the surrounding hills turn into green carpets of nature? If you would love to do so, then the beauty of Rajasthan during the monsoon season is your thing. So, before this beautiful season ends, plan a tour of Rajasthan and enjoy its unseen magnificence.